The Nelson Mandela Bay Business Chamber held a breakfast recently for women in its Top 40 Under 40 achievers club to celebrate the impact of women in business in the metro. The breakfast, held at The Plantation in Port Elizabeth, saw panelists such as UDDI chief executive Patricia Dlamini, NMMU Trust acting chief executive Renita Affat, NNMU Professor Vivienne Lawack, Adendorff Architects and Interiors head Dr Gillian Adendorff, MDA planning and development manager Dorelle Sapere, among others. The ladies shared useful insights about running a business, making tough career choices, corporaqte leadership and the often-elusive balance between climbing the corporate ladeer and managing a family life. The sky is the limit for a former NMMU student who won an award at the Sylbna Fashion and Lifestyle Awards. Oyama Dyosibi's agency, Oyama Management Agency, won best modelling and acting agency in South Africa. The awards, which recognise young up-and-coming entrepreneurs in the field of fashion and lifestyle was held at Gold Reef City in Johannesburg. Dyosibi is also a model booker, photoshoot creative director, producer and publicist and an actor where he starred on shows like Tempy Pushes on SABC 1 and A Wannabe on e.tv. The tournament was played across all three formatsd, with mne's and one women's singles matches, one men's and one women's doubles and two mixed doubles. THE music department of the Nelson Mandela Metropolitan University hosted a woodwind studio concert recently at the South Campus Auditorium. The lunch hour concert featured woodwind ensembles, solo works and chamber music. The university's clarinet studio has achieved much acclaim this year with Grant Snyman winning the tertiary section of the South African Society of Music Teachers competition and fellow student Tiaan Uys being runner-up. 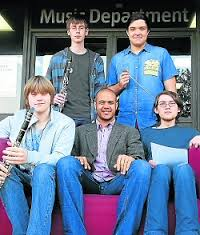 Uys also came third in the tertiary category of the National Music competition in Grahamstown in June. Pupils at three Port Elizabeth schools, Sanctor, Woolhope and Gelvandale High Schools, have been given a boost to supplement the maths and science which they are learning in their classrooms with the help of hi-tech, curriculum-aligned video lessons on desktop computers to be used for pupils in grade 10, 11 and 12. 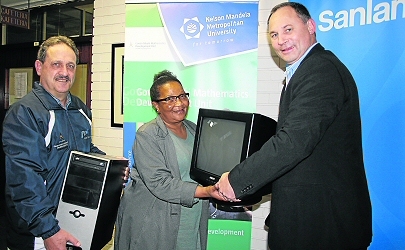 The offline, technology-based maths and science support programme available on the computers has been developed by Nelson Mandela Metropolitan University's Govan Mbeki Mathematics Development Unit and the university's FirstRand Foundation chair in maths education. AN NMMU lecturer and BA Hons NMMU graduate, Dr Ruby Somhlahlo-Zauka, assists second languauge students with bilingual study-buddy lessons which has seen pass rates boom higher this year. First year lecturer for the modules English for academic purposes (communication in English B) said the course foucessed on listening, reading acade inc texts and articles, writing academic essays and public speaking. Somhlala said that she hopes the programme will grow and have lessons explained in other courses too. Suliwe Sihlwayi at the "Women of IT" function hosted recently. LEADING Port Elizabeth architectural firm The Matriz has added another national award to its growing collection of accolades after receiving the 2014 South African Institute of Architects (SAIS) Merit Award. Conservatory in ST George's Park. The company is is also involved in high profile projects at the city's Opera House and also boasts a string of awards from the Easyern Cape Institute of Architects (ECIA).